Most small coolers I use to bring hot food home aren't long enough for sub sandwiches, this one is. 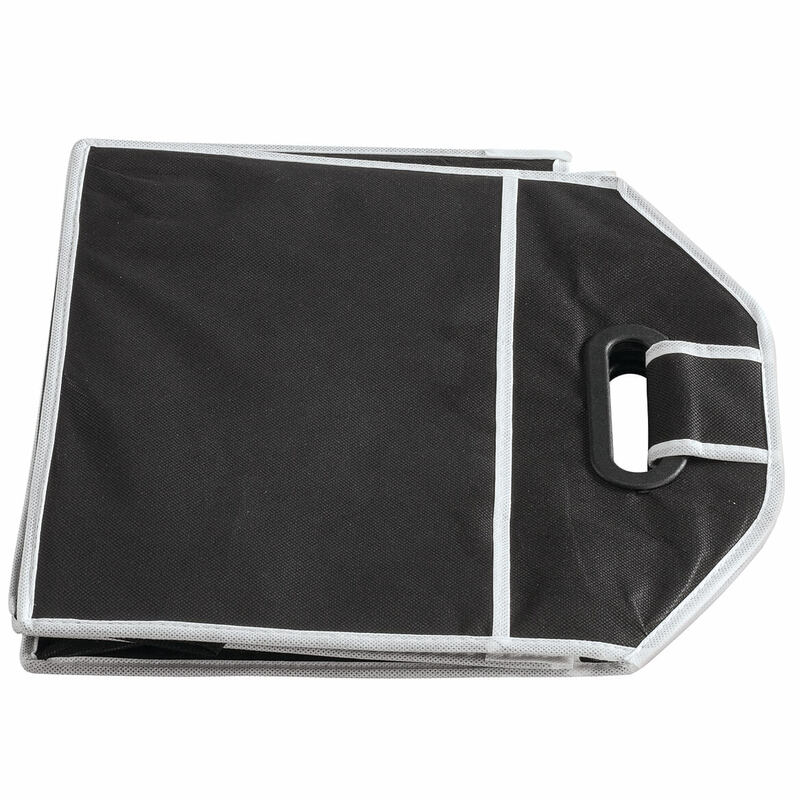 Folds up by itself when empty, stays open when only 1 compartment is full, others fold up flat. No more stuff rolling around in the back seat. I was so impressed by the first purchase of one of these, I purchased another because I have a huge trunk! They really come in handy especially when you have refrigerated and frozen items. Nice!!! We use the "trunk organizer" for putting bagged groceries in the back of our SUV. 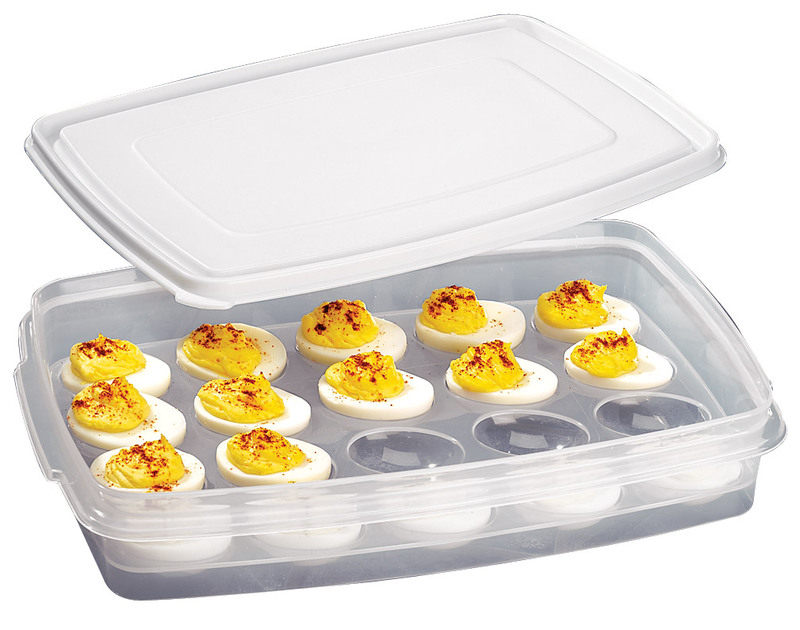 Works great and very easy to use and store when not in use. More grocery bags can be sat next to the right or left keeping them from falling. Iit works great for my SUV . Love this! Every car should have this. This keeps my groceries from rolling around in the trunk. I may end up getting another one. Wish it was a little bigger. It holds quite a lot in each compartment and the space that it uses is minimal. Love it! I have 2 of the trunk organizers, one in each car. I keep it in the trunk. It keeps objects from moving all over the trunk. i love this! it doesn't tip over like my bags do. i was deciding whether to buy wash baskets to keep my groceries from falling out, but i also needed room for my sister's big walker. this is perdect because it works and it is collapsible! 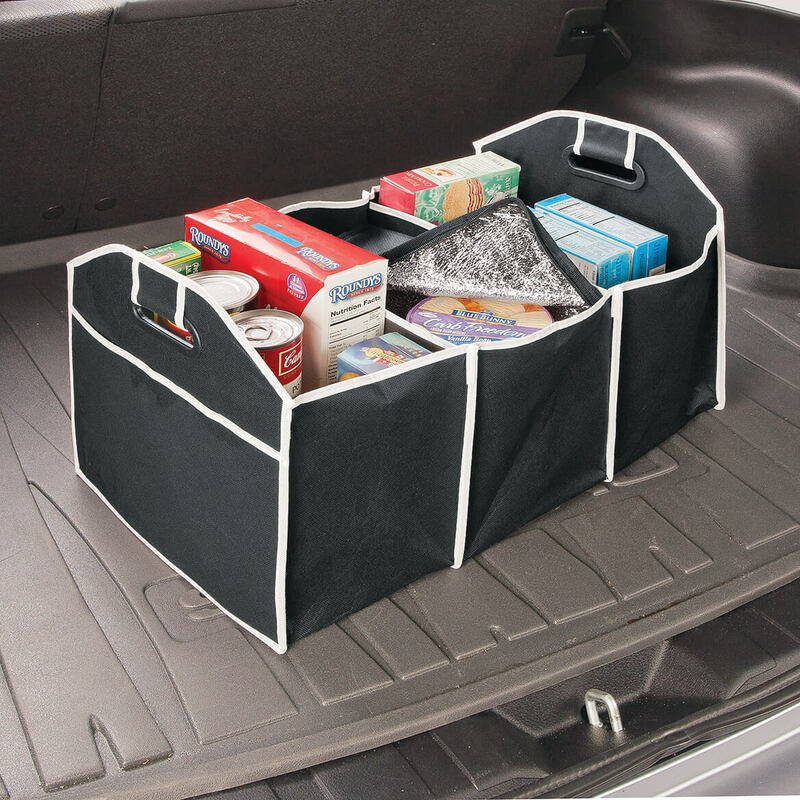 This is awesome, really helps when putting your groceries in the trunk,they don't fall out everywhere. I love it keeps everything in my car trunk from falling . I use this in my trunk to organize my shoes. I bring changes if shoes for work and play. This is such a great product. It probably could hold 4 more pairs. Love it! I'm so glad I bought two. The insulated bonus compartment is great for keeping my ice tea cool. I can't say enough about this clever product. Thus could be used for many purposes. Keeps everything from sliding all over in the back of SUV! Keep it in the back of our SUV and use it to keep purchases from sliding around after we go shopping! The cooler is an added touch good for the frozen items bought at the grocery store. It fords up easily and is easy to store. It is not heavy duty for carrying items though. This item is much better-made than one I had bought elsewhere...it is made of a durable material and the handles aren't flimsy. I haven't yet used the cooler portion, so I can't say whether or not it really keeps things cool for any length of time, but I think it will be fine for getting cold items home from the grocery store. Just the thing to keep those plastic bzvs from spilling all over. Great for keeping the kids stuff sorted. IN CAR, I PUT Some of THE LOOSE ITEM IN MY Trunk in but all didn't fit.too small length wise. ILOVE IT ITS JUST A LITTLE SMALL BUT IT DOES THE JOB. When I do my shopping. Should keep items from falling over in the trunk of my car. It doesn't seem to be too sturdy, tho. Looks great except for the zipper on the cooler which is only partially sewn to the lid so ability to keep cool will be compromised. 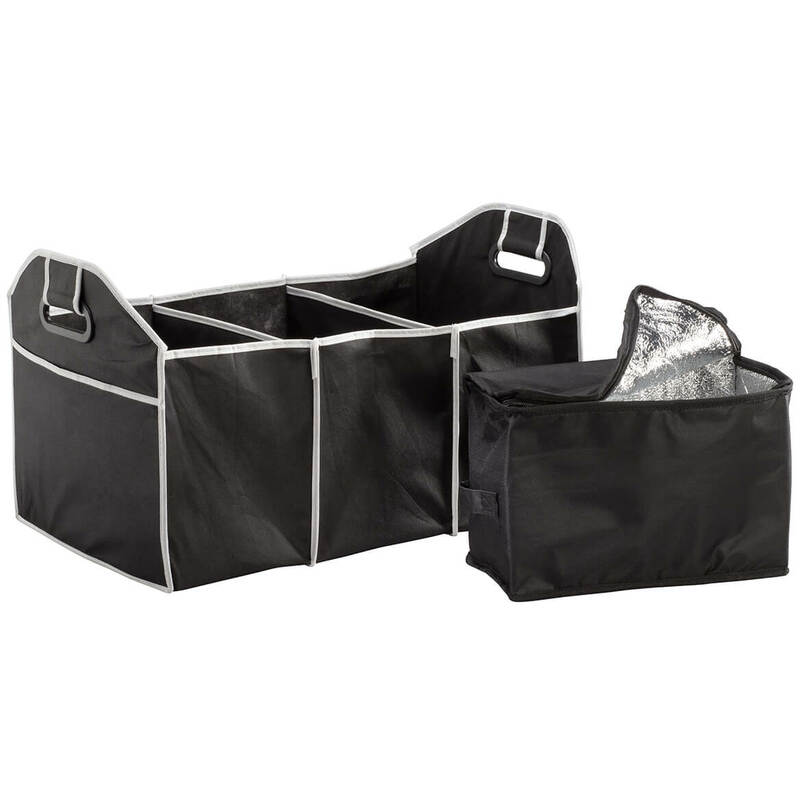 I was replacing my grocery organizer / carrier that I keep in my car with this organizer, but the material does not seem sturdy enough so that I will be able to actually carry the groceries in it from the car into the house as I do with the one I currently have. Since I got two, I guess I will eventually try and hope it does not rip and I end up with groceries on the floor. Great concept but needs to be of a better / thicker quality material to really serve its purpose (organize stuff in you car and be able to carry it into the house). Priced a bit too high for what you actually get. I bought this to replace another one I had, and I am sorry I wasted my money. It tore the first time I used it. I put in an item that toppled over and as it did, it ripped one of the sections completely. I had thought about returning it, but I had tossed all the paperwork and didn't want to bother paying postage for something so not worth it. Poor quality, will not hold much at all. The first time my husband used it he used it for groceries. When he loaded the "organizer" with the grocery bags and picked it up to carry it in the house, the handle broke. We had just taken the the organizer out of the package just before he left for the grocery store. We were terribly disappointed. Very cheap material. In fact, mine was already torn when I opened the box so I will be returning the item. Tried to rate it as "0 stars" but that was not an option. 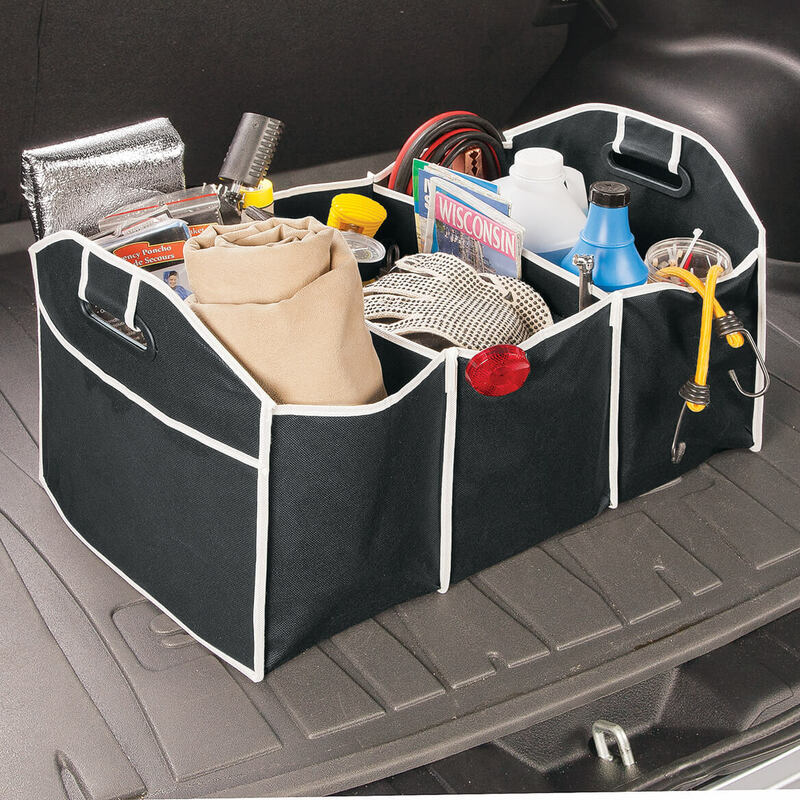 This organizer wouldn't last one day in your trunk. Cheap, cheap, cheap! Be worth trying, especially if it do3s assist me in keeping the rear on my Subaru better organized. I re-ordered this item because I already had one and love it. It keeps groceries from rolling around in the back of my SUV, it also keeps things like milk jugs from tipping over in the cargo area. My mother saw it and liked it too, so I ordered her one as a surprise. For organization in my Jeep. I already have one and they are great in the back of my van when I go to the grocery store. Keeps the groceries from rolling all over the place before I get home. It holds a lot, but sometimes you have that big shopping trip and you just need more than one. Folds up when not it use. Perfect! Now I’ll always have space for my groceries without rearranging anything. I like an organized car. This item I've have been looking for awhile to hold groceries in. It's a great idea and the cooler is just a plus. Because I can really use it. 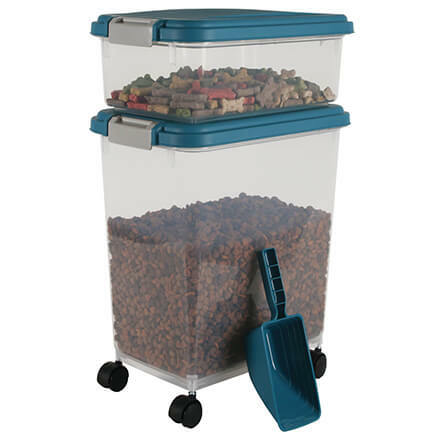 Convenient organization for groceries or other items kept handily in vehicle. convienence of transport & groceries not rolling everywhere plus cooler add-on . To keep items from moving around in back of after going shopping. I have a messy trunk and I hope this can help organize everything. I have a Subaru forester and this will help to organize the trunk. Things always rolling around or falling from my trunk area. Have been looking for a long time for something that is reasonable & will work. Back of my mini van needs support from groceries and supplies moving back and forth. Looking forward to a place to store items while being transported. A friend had these items in her trunk and I liked the way groceries in plastic bags were supported and kept items from escaping the bag and rolling loose in the trunk of her car. Have been thinking about getting something like this for myself; decided they would make great gifts. 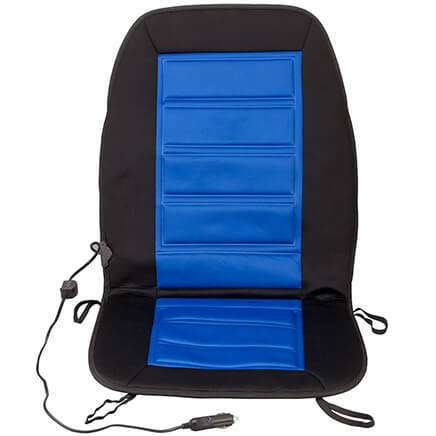 I have a small trunk in my car and need this desperately. It fits the bill for what i need when going shopping, especially the detached cooler feature. I have a van (a transit 350 for one of my sons' wheelchair) and there is not way to shop without the purchases being rolling all over. hope this will work for our family. To use for a fundraiser. Things roll around in my trunk and this should prevent that from happening any more! Grocery bags always toss around and lose their contents in the back of my SUV! I hope this container will end this! I have one and have worn it out. I have a rather large trunk and am hoping this will help keep items from being tossed around in the trunk. To keep things in trunk organized, not flying around! These are handy for holding items bought at Costco and getting them into the house without having to use cardboard boxes that are a pain to get rid of. The one I got free from AARP finally fell apart.